While walking down the streets of Bandra, we entered the bylanes and finally landed up on Waroda Road for a quick stroll. We then discovered a colourful little store that gave us home décor goals – Urban Desi. We’ve listed down five of our favourites from this store, so grab your shopping bags already! If you’re into funky stuff, this place will be your second home. They have a cute range of hand-painted kettles, shot glasses, tapri chai cups, quirky mugs and even painted bottles to store liquids and bulb sippers. Their range starts from INR 300 so there’s enough and more for you to pick. With bright prints to set your hearts racing, their collection of bags is sure to liberate that free spirit in you. 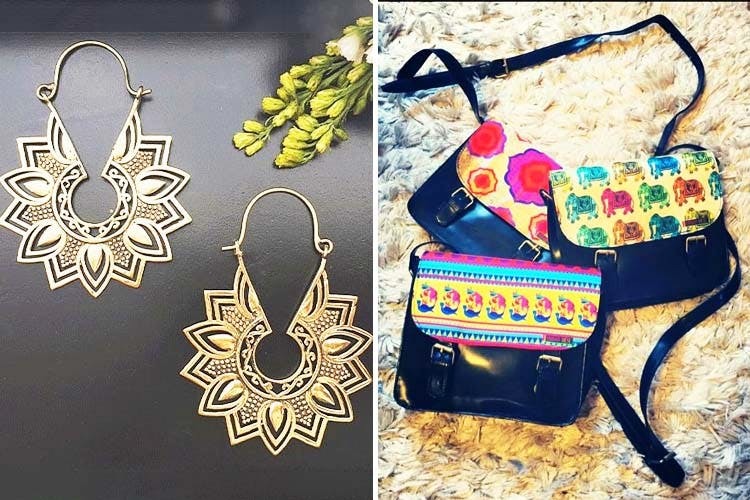 Their entire collection is handmade and designed by them, with all sorts of patterns available – from Aztec to Indian prints, motifs to even dreamy figures, they’re all unique and pleasing to the eye. The price starts from INR 1,500 for all their bags, and for their size, it’s a great deal. Their range is varied here, from pure silk to chiffon, kalamkari, to even linens. They also have a collection of palazzos and silk kurtis that you can sport for any occasion. They also have readymade blouses that you can mix and match with the sarees you pick, so it makes for a great set for those special moments. Their blouses start at INR 1,200 and their sarees at INR 2,950. A steal, if you ask us! If you’re the boho chick variety, this is going to set your soul on fire. Their earring collection is, let’s put it this way, pleasing to see and look hot once worn. With feathers, tassels, trippy chakras and the works, there’s a lot going for you here. They also have some pretty interesting necklaces to suit your every mood, so basically, they’ve got you covered for those fun, frolicky nights you’re planning. Their range begins at INR 350 a pop. Now, this is what got us so excited. With pure brass and wooden artefacts that adorn their store, there’s just so much to choose from. You have bookends, a crazy variety of candle holders, wooden boxes to store jewellery or any other precious item, photo frames, statues, lanterns, cushions and so much more to pick from and set up that corner at home. Their range begins at INR 500 and can go up to INR 5,000.